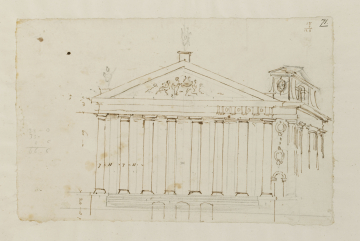 [7/1] Sketch design for a rectangular chapel with 60-feet-high Doric columns, the principal long elevation having an eight-column pedimented portico, approached by steps; the side (west) elevation having two pairs of fluted columns carrying an arched and pedimented attic. You are here: CollectionsOnline / [7/1] Sketch design for a rectangular chapel with 60-feet-high Doric columns, the principal long elevation having an eight-column pedimented portico, approached by steps; the side (west) elevation having two pairs of fluted columns carrying an arched and pedimented attic. By Hawksmoor in brown ink with height and width dimensions for the left half of the front portico, and in graphite with a calculation of the total half width (66 - 0); and with calculation at top right-hand corner, 18 / 7 / [total] 126; and at top right in dark brown ink in C19 hand, 71. This incomplete design is probably an initial sketch for a chapel terminating the central axis in front of (or, perhaps, in place of) the Queen's House in the revised first enlargement scheme in 1711. Hawksmoor's final master plan scheme of 1728 in the RIBA Drawings Collection has a concealed plan of a long rectangular chapel in front of the Queen's House, with four groups of columns on the front and back elevations and four-column porticoes on the end concealed beneath a later pasted flap on RIBA SA 70/4 (former E5/9; RIBA G-K cat. Hawksmoor, /1; see Downes 1979, cat. no. 326, fig. 5). The design has a podium and a giant order of the same dimensions as those of the chapel in the second enlargement scheme in 1711, i.e. the floor of the chapel is set 20 feet above ground level, the columns are 60 feet high, and the entablature is 12 feet high (see [8/3]). The columns would have been taller than those of the King William West Dormitory (47 feet). However, columns with diameters of 7 feet would have been almost impossible to build, and this may explain why Hawksmoor changed from the Doric order to a more slender, Corinthian-style order in the second enlargement scheme [8/2 and [8/3]. In these designs the columns are consistently 6 feet in diameter. Hawksmoor has drawn in graphite, over his ink lines, a preparatory study for a revised portico with 6-feet diameter columns. The column-centres for this alternative scheme are marked with vertical lines and by dots along the horizontal axis of the top of the cornice. The dots are at 14-feet centres. This produces intercolumniations of 8 feet, or 1 1/3 modules, a narrow proportion, even for the Corinthian order (normally 1 ½ modules). The flight of steps up to the portico belongs to this pencilled revision rather than to the original pen-and-ink design, for the steps are drawn over three equally spaced arches beneath the central three intercolumniations of the original portico. If we consider only the initial ink drawing, and ignore the pencilled additions, it can be seen that the portico would have risen from a cliff-like podium 20 feet high, and have been entered at basement level through the three arches. The top of the podium would have been level with the bases of the columns of the infirmary ranges of the first enlargement scheme in 1698-99 [7/2] and [7/3]. The bottom of the podium would have been level with the ground at the base of the King William and Queen Mary Courts (in [7/2] there is a 20 feet difference in height between the baseline of the King William West Dormitory and the top of the podium of the infirmary range). This 20-feet-high podium implies a chapel standing on ground below that of the infirmary ranges. The impracticality of this arrangement may have led Hawskmoor to revise the scheme to set the chapel on a higher level. The higher level is marked by a horizontal line in graphite. It is about 9 feet higher than the original ground level, which coincides with the bottom of the sheet. This would have brought the ground level closer to that of the infirmary ranges in [7/2] and [7/3] (the podium in [7/3] is about 8 feet high). Raising the ground level at the base of the chapel was linked with the change to a more slender order, for the initial 20-feet-high podium was proportioned as a base for the more massive Doric order, with 7 feet diameter columns. The three arches may have been intended to provide access to an east-west cross-route beneath the building. At the west end is a projecting entrance bay, with pairs of fluted Doric columns either side of a wide central intercolumniation. Above is a pedimented attic stage, with a central arched opening, concave buttresses, and a roundel in the end wall. This is probably a belfry stage and marks the west end as the ceremonial entry to the church from Greenwich. The design is for a buillding that looks two ways, west and north. As such it anticipates the later schemes for the chapel. If correctly associated with the revised first enlargement scheme, it is of particular interest as the earliest known proposal by Hawksmoor for a new church at Greenwich following the decision, in 1711, to direct money from coal tax towards the building of fifty new churches London.